The first official image of a Russian-European manned spacecraft has been unveiled. It is designed to replace the Soyuz vehicle currently in use by Russia and will allow Europe to participate directly in crew transportation. The reusable ship was conceived to carry four people towards the Moon, rivalling the US Ares/Orion system. Unlike previous crewed vehicles, it will use thrusters to make a soft landing when it returns to Earth. Russian aerospace writer and graphic designer Anatoly Zak has produced artist's renderings of the new craft based on a design released by Russian manufacturer RKK Energia at the Farnborough Air Show in the UK last week. In some respects, the capsule resembles America's next-generation spacecraft Orion. The 18-to-20-tonne Russian-European vehicle is designed to carry six crew into low-Earth orbit and four on missions to lunar orbit. One of the most unusual features about the capsule appear to be the thrusters and landing gear on its underside. Mr Zak said it would use these engines to soften its landing on Earth after the fiery re-entry through our atmosphere. The European Space Agency (Esa) has been talking to its Russian counterpart Roscosmos about collaborating on the Crew Space Transportation System (CSTS) since 2006. 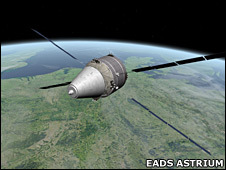 "If Esa and the Russian Space Agency reach agreement, Europe will supply the service module of that co-operative spacecraft," Mr Zak told BBC News. This service module will use technology - such as the propulsion systems - developed for Europe's Automated Transfer Vehicle (ATV), an unmanned freighter recently sent to re-supply the International Space Station (ISS). Russia may provide the launcher for the new manned spacecraft. This might be an entirely new vehicle, or a modification of an existing rocket. Mr Zak said Russia was insisting in its negotiations with Europe that all future manned projects be based in Vostochny, the new cosmodrome being developed in Russia's eastern Amur region. The Russian government wants to host its first manned launch from that site in 2018. At the moment, all manned Soyuz launches take place from Baikonur Cosmodrome in Kazakhstan. Alternatively, the space agencies could opt to "man-rate" Europe's Ariane 5 launcher, which lifts off from Kourou in French Guiana. This would allow the rocket to carry humans into space. This would involve making major modifications to Kourou spaceport, including the development of infrastructure to support a crew escape system in the event of an emergency. It is quite possible that both launch sites would play a role in any collaborative programme, which would necessitate the lofting of cargo as well as human crew. However, if this collaboration falls apart, Europe has another option for direct manned access to space. In May this year, European aerospace company EADS Astrium unveiled its own model of a crewed space vehicle, described as an "evolution" of the ATV, which was built by a consortium of European companies led by Astrium. It would combine what is essentially the avionics and propulsion end of the ATV with a crew compartment taking the place of the current cargo section. Mr Zak commented: "I think the main roadmap is the agreement between the European and Russian space agencies. That is their Plan A. Their Plan B is the initiative made by EADS Astrium in Bremen." But if the agencies want a manned craft capable of reaching the Moon, they will need to develop new, more powerful rockets than those on the drawing board today. "This is an open question, there are no decisions on how to proceed," said Mr Zak. The CSTS is also sometimes referred to as the Advanced Crew Transportation System (ACTS). Esa and Roscosmos started talks on the project after some Esa member states rejected further involvement in the development of another manned spacecraft called Kliper. The proposals will go before a crucial meeting of space ministers from European member states in November this year.